MTS Software Solutions is automating loan set-up and preparation, so lenders can turn more applications in less time with fewer resources....without risking compliance. 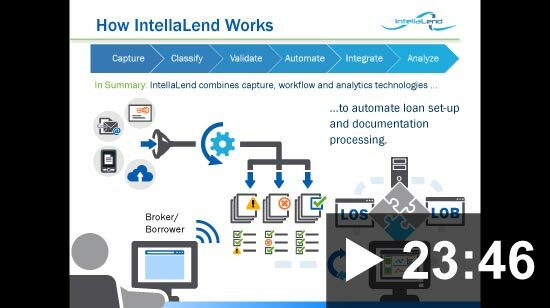 MTS Software Solutions Inc. invites you to watch our webinar highlighting IntellaLend, our mortgage processing automation solution. IntellaLend combines intelligent capture, workflow, and analytics technologies to minimize manual effort in mortgage processing. Experts from MTS Software Solutions provide an overview of the existing challenges in the marketplace and how IntellaLend is revolutionizing the bottleneck in the loan documentation processing. We look at a little closer into how implementing a mortgage processing solution means more productivity and the potential bottom-line benefits to your organization. Watch the webinar and take advantage of an opportunity to learn more about how MTS Software Solutions and our partners are shaping the future of mortgage processing!